I had the pleasure of growing up in the Willamette Valley in Oregon where it was hard to have a bad crop of blueberries any year no matter the weather. Then I moved to Sonoma County and found that there is a difference in soils, climate, and birds. In our county the soil is often quite heavy, with the exception of the West county. This adobe soil is very fertile but it has a ph of about neutral (pH 7) whereas blueberries require very acid soil (pH 5.6 or lower). This difference is substantial and must be addressed before any plants are placed into the ground. The best way that the pH can be lowered is with copious amounts of sawdust or some other high acid wood product. This should be done at least a year before any plants are purchased, as it takes quite a bit of time for the wood to break down. In the winter of the next year take a sample of the soil to determine if the ph is low enough. If not, you need to add more sawdust and wait for another year, as the plants will not thrive if the pH is too high. Blueberries require cross-pollination to set fruit, meaning that bees need to be able to visit plants of different varieties that bloom at the same time. Plant the bushes close enough to each other to allow bees to easily visit the different varieties. Once the bushes have been planted they should be mulched with a thick layer (six inches) of shredded bark or sawdust over the entire root area as they are shallow rooted. This mulch will retard weed growth, protect roots from extremes of temperature (they do much better if the roots stay cool in summer), and help hold soil moisture. The main feeder roots are found quite near the surface and are easily injured, so any weeds that do grow should be hand weeded. These plants will grow in any area of the yard regardless of the intensity of the sun, if the above planting methods have been adhered to regarding the pH and the bark cover over the roots. There are a number of diseases which can affect blueberries but in my 40+ years of growing them in this county, I have never had a problem. I attribute this to the good care that the plants have received throughout the year. Fertilization of blueberries is very important. A complete fertilizer such as one with an analysis of 5-10-10 should be used every third year. Ammonium sulfate at the rate of 1/2 pound per plant is very beneficial and should be applied annually. Application of ammonium sulfate can be divided, using half in mid February and the rest at the end of April which corresponds with the bloom time and the fruit set. The fertilizer should be spread to cover the root zone of the plant but keep away from the crown. Pruning is essential for good crop production. Little or no pruning should be done the first three years except to remove the flower clusters allowing the plant to build strength. After this, weak growth should be removed to a strong lateral or to the base, and old canes taken out as the plant needs thinning. All pruning should be done in the dormant season, which is winter. Irrigation is necessary for good blueberry production. Plants require about an inch of water each week during the producing season. Once the fruit begins to turn blue it is necessary to net them with bird netting. Birds do not wait until the berries are ripe before they test them one at a time over the entire bush. A simple scaffold can be made of PVC tubing, and then the netting placed over it and stapled to the soil. This covers all parts of the plant with the netting and doesn’t allow the birds to reach through and steal the berries. The birds will find a way to get into the cage is there is a slight opening somewhere. They are quite persistent. If this seems like a lot of work, it is, but it is worth it! The work is mostly up front, as you get your site ready, plant and make your scaffold. 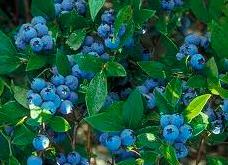 Other than that, there is not much more work than any other crop, and blueberries have the advantage of being long-lived perennials that you don’t have to replant every year. Besides, if you have never tasted a home-grown blueberry, you have no idea ho good they can be. And there are so many ways to eat this very flavorful fruit which is loaded with antioxidants: fresh, in pies, muffins, fruit breads, ice cream, jam, even dried. If you have an abundant crop you can freeze them for baking and making fruit smoothies all year. All this in a sphere no more than 3/4 inch across!